Saian Pumpkin Spice Maskl 3.3 oz. Saian Pumpkin Spice Mask, Hydrating, and will help dissolve dead skin cells, cleans pores. 3.3 oz. This vitamin-rich masque stimulates blood flow and decongests as it nourishes the skin. It is designed to help dissolve any dead skin cells, make-up residue and debris on the surface of the skin and deeply cleanse the pores. SAIAN Pumpkin Peel does not require refrigeration, and can be used for the face, as well as for the whole body. Peraben-free, artificial fragrance-free, artificial color-free. 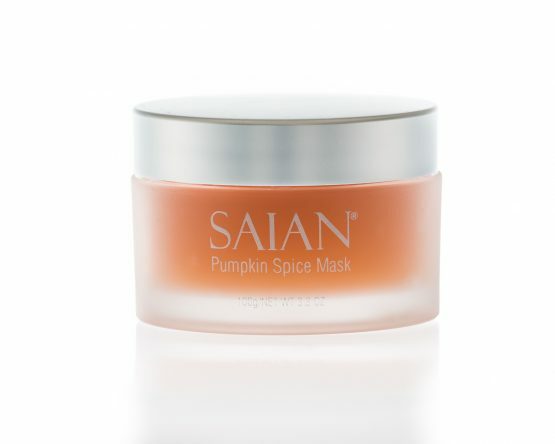 Saian Pumpkin Spice Mask is based on fresh pumpkin, hydrating vegan hyaluronic acid, aloe vera, carrot seed oil, and sea buckthorn! It is designed to help dissolve any dead skin cells, make-up residue and debris on the surface of the skin and deeply cleanse the pores.This vitamin-rich masque stimulates blood flow and decongests as it nourishes the skin. Enzymes in pumpkin exfoliate dead skin cells while promoting skin repair, cleanse, condition, and moisturize while helping to firm the skin. It is an excellent source of antioxidants, vitamins and essential elements the skin needs. Pumpkin enzymes stimulate circulation and blood flow to help remove toxins. Sea buckthorn contains vitamins B1, B2, K, C, A, E, folic acid, over 60 antioxidants, and at least 20 minerals. Vitamin E is a powerful antioxidant that helps to build up the skin’s natural moisture barriers, and promotes cellular renewal. (Face) Apply to face and neck, avoiding the eye area. Allow to penetrate for 10-15 minutes. Remove completely. After you rinse your face, finish with one of Saian's wonderful firming products. This gives you a wonderful spa experience at home.